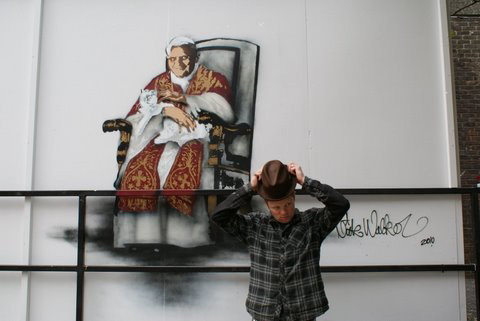 While the pontiff begins his tour north of the border, artist Nick Walker has busied himself by creating the first papal graffito. This likeness of Benedict XVI graces the front of the Royal College of Art, next to the Albert Hall. It depicts the Holy Father with a slightly manic grin and stroking a white cat, like Blofeld or perhaps Dangermouse nemesis Baron Silas Greenback. Thanks to Zara Shirwan for the photo and the tip-off.